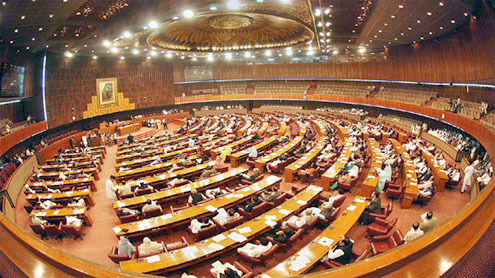 ISLAMABAD: The National Assembly on Thursday unanimously passed the crucial Constitutional Amendment Bill 2017 which seeks fresh delimitation of constituencies ahead of the upcoming general elections on the basis of provisional results of the population census. The NA also passed the bill regarding the amendment to Elections Bill 2017, which pertains to restoring the Finality of Prophethood clause to its original form. The bill retained the status of Ahmadiyya community in the light of constitution, and the affidavit has been restored in its original form. Both the bills were presented before the assembly by Law Minister Zahid Hamid which will be sent to Senate after their passage from the NA. The parliamentarians cast 242 votes in favour of the amendment, which required 228 to pass with a two-thirds majority in the house of 342. According to the latest amendment, while the number of NA seats will remain the same, Punjab will lose out on seats as its proportion in Pakistan’s population has fallen to 52pc in 2017 from 56pc in 1998. The provinces of Balochistan and Khyber Pakhtunkhwa will gain the seats lost by Punjab, while Sindh’s share will remain the same. Earlier, Ayaz Sadiq said reservations of opposition parties with regard to delimitation had been removed. “The issue of delimitation had been solved after evolving consensus among the opposition parties,” he said while talking to media persons after chairing a meeting of parliamentary leaders. He said that on the demand of PPP, the issue of delimitations had been discussed in the Council of Common Interests (CCI). He said representatives of the PPP could not attend today’s meeting due to certain reasons. The meeting ended with a consensus among all the parties over the delimitation bill. Earlier, Prime Minister Shahid Khaqan Abbasi, who is also the leader of House in the National Assembly, while taking the floor of the House, said that the issue of raising census blocks from one per cent to five per cent for a third party audit would be presented before the Council of Common Interests (CCI) for approval. He said the decision about audit of one per cent census block had been made in the previous CCI meeting. “However, the Muttahida Qaumi Movement-Pakistan, Pakistan Tehreek-e-Insaf and Pakistan People’s Party had called for raising it from one per cent to five per cent,” he added. The prime minister said that in the meeting of the parliamentary leaders, it had been agreed to take up the issue of the audit of five per cent census data in the CCI meeting. He said suggestions by the parliamentary leaders would be reviewed in the CCI meeting. Meanwhile, the MQM-P shared some reservations about the bill. Railways Minister Khawaja Saad Rafique suggested that to resolve MQM’s reservations, another session of Council of Common Interests (CCI) can be summoned again. The issue of Finality of Prophethood clause in the Elections Bill 2017 was also raised and all the parties mutually agreed to restore the clause to its original form. Addressing the session, Hamid said sections 7B and 7C of the Conduct of General Elections Order, 2002 have been restored to their original form. “I am a lover of the Prophet (PBUH) and have performed two Hajj and several Umrah pilgrims… I can’t even think about changing the clauses on Khatm-e-Nabuwwat,” he said in his address. Amended bill will make the clauses relating to Finality of prophethood more effective and a separate voters list will be created for Ahmadis as they will not be included in the list for Muslims, said the law minister. He said the Khatm-e-Nabuwwat declaration has also been restored to original form in English and Urdu through the amended bill. Reacting to law minister’s statement, Interior Minister Ahsan Iqbal said that faith was a personal issue and between man and the Almighty. “Should we go door-to-door to announce that we are Muslims?” he questioned. Sheikh Rashid objected to Iqbal’s comments, saying he started speaking without knowing anything. Hamid did not issue the statement on anyone’s behest and it was his own opinion, he added. Seeking the speaker’s ruling, Sheikh Rashid said the point of view of the two ministers differed. “If anyone is Ahmadi or ‘Mirzai’ then he would have to declare it officially,” he remarked. Furthermore, no member of Pakistan People’s Party (PPP) appeared for the meeting of parliamentary leaders. However, Ayaz Sadiq had called Opposition Leader Khursheed Shah during the session. “All demands of Khursheed Shah have been met,” Ayaz said while speaking to media. Addressing the media after a meeting of political parties, Sadiq had said all parties are united with regards to the bill and will vote for it in the NA when it is tabled. There had been a difference of opinion among the political parties over the passage of the bill as PPP and Muttahida Qaumi Movement (MQM) had reservations on the census and demanded the convening of the meeting of Council of Common Interests (CCI) which was held on Monday. During the CCI meeting, chaired by Prime Minister Shahid Khaqan Abbasi, the PPP-led Sindh government had agreed to amend the article of the constitution regarding delimitation of constituencies conditionally paving the way for the National Assembly session. The ECP had earlier directed both the law secretary and statistics division secretary to ensure necessary amendments in the law. The ECP can conduct new delimitations only after it receives the final report of census data and maps from Pakistan Bureau of Statistics, but the latter has expressed its inability to publish final results of the census before April next year. The ECP had also emphasised immediate passage of the Delimitation of Constituencies Bill as its officials say that delimitation of constituencies is a lengthy process and will take at least six months. They say that if the commission is not allowed to carry out new delimitations on the basis of the provisional census results, then this will delay the holding of general elections on time. To avert this crisis, the government had decided to enact the necessary legislation to allow the ECP to conduct delimitation exercise on the basis of provisional census results. It’s important to note that all political parties voted in favour of the amendment with the exception of MNA Jamshed Dasti, who said that he had reservations over the recent census and announced to approach the courts against the constitutional amendment. Moreover, 62 PML-N MNAs were not present. It’s pertinent to mention here that the Pakistan Tehreek-e-Insaf (PTI) and AML had challenged the Election Act 2017, which paved the way for Nawaz Sharif to become head of the Pakistan Muslim League-Nawaz (PML-N) after his disqualification in Panama Leaks case ruling on July 28.